When I sketch the moon, it feels like my hands move through my eyes. My sight becomes my fingers and explores the lunar landscape. My fingers mirror my sight and do their best to transport the images I love through pencil, pastel or conte to the page. I often wish to touch the edges of craters, or plunge my hands deep into the lunar regolith. Sometimes I imagine how it would be to sit in Mare Imbrium and look up at Montes Appenines. I wonder how it would be to set up my scope there and sketch the Earth in all her colour against the blackness of space. The learning experience of sketching celestial objects, is without doubt the best I have ever encountered. I am learning the sky by observing, absorbing, and sketching it. Why don't you have a go ! This sketch was an experiment in pastel and conte greys on black paper. I felt it was a good approach as the media came in colours/grey tones very similar to the lunar surface as I saw it. I enjoy bringing light to a sketch, Aristarchus was glowing and its ray system shot out through the lunarscape announcing its presence. Drawing a 160 km U shaped valley with a pencil seems difficult but if you look closely enough you will delight at how little it appears from this Earth. This was such a satisfactory experiment; I decided it was worth developing further. I have discovered that to achieve a good sketch, you have to want it. You have to look at what you wish for in a way to observe it and absorb it. You must take a mental note of your target; this is the kind of thing I ask myself when I look at the moon for a sketch. When you look at the moon, you must let it into your heart as well as your eye. You must observe and absorb your target for good while before you begin to sketch.This is one of my telescopes it has an 8 inch mirror at its base. This mirror gathers the light from the moon or whateverI am looking at. This light is then sent to a second mirror closer to my eyepiece. When I focus and look in then I see the object I wish to sketch.With this telescope I have made most of the sketches on these pages.If you do not have a telescope you can still learn the sky through observing and sketching if you really want to. 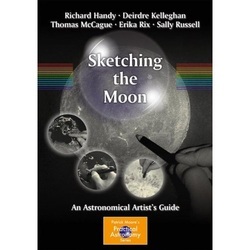 I am making a tutorial on moon sketching , it will be here soon. This image is a combined photograph and sketch from a collaboration between myself and sketching friend Sally Russell.